The NC Foreclosure Prevention Fund is a renewed, limited time program of the U.S. Department of the Treasury, also known as the Hardest Hit Fund. You can benefit from funding for monthly mortgage payments to catch-up past due amounts, or payoff existing second mortgages, and even reduce principal balances for qualifying homeowners. We’ve assisted over 2,000 Charlotte NC homeowners to receive an estimated $40 million in benefits from this special government program. If you’ve experienced a qualifying hardship, you can apply today! In NC, the first program we review for eligibility is the NC Foreclosure Prevention Fund. This program offers foreclosure prevention loans to the unemployed, under-employed, and formerly unemployed. If you are unemployed or have lost more than 10% of your income due to changing economic conditions, you may be eligible for the NC Foreclosure Prevention Fund. This program is administered by the N.C. Housing Finance Agency and funded by the U.S. Treasury’s Hardest Hit Fund. The foreclosure prevention fund provides mortgage payment assistance while you are looking for work or going to school to learn new job skills. Our counselors will assist you to determine if you qualify. Get more details. The NC Foreclosure Prevention programs help homeowners prevent foreclosure. Many of them are listed here, but new programs, including federal, state and private programs are being introduced frequently. It’s best contact one of our certified counselors to see what your options are, by using the form at the right or calling us today! The options fall under two general categories, retaining ownership and relinquishing ownership. Is there a fee for Foreclosure Counseling? What options exist for homeowners at risk of foreclosure? How long does the housing counseling process take? What documents are needed at initial housing counseling session? When foreclosure counseling has started, should a homeowner to talk with their lender? 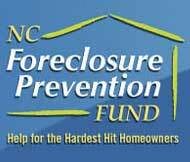 What is the NC Foreclosure Prevention Fund? 1. Is there a fee for Foreclosure Counseling? No, we do not charge a fee for foreclosure counseling. In fact, if anyone wants to charge a fee for foreclosure assistance, it is against the laws of almost any state. As a non-profit housing counseling agency, certified by the U.S. Department of Housing and Urban Development (HUD), we provide free housing counseling to those who are at risk of foreclosure. 2. What options exist for homeowners at risk of foreclosure? Options are determined on a case-by-case basis, and vary with the type of loan, payment status, lender and the homeowner’s financial situation. Homeowners having difficulty meeting their mortgage payments are encouraged to call our HUD approved housing counseling agency at (866) 303-3328. A certified housing counselor will identify all possible solutions and provide follow-up and support to the homeowner. 3. How long does the housing counseling process take? The length of the initial counseling session averages 45 minutes to 1.5 hours. While it is getting quicker, it wil take a lender several weeks, or perhaps even months, to work out loan modifications. Our housing counselors will guide you through the process. 4. What documents are needed at initial housing counseling session? In order to assist each homeowner, we need to have authorization forms, loan documents, a detailed budget, hardship letter, two most recent months of bank statements and pay stubs. These items must be available in order to complete a full initial counseling session, and to submit the paperwork to a lender for consideration of a loan mod or other arrangement. 5. When foreclosure counseling has started, should a homeowner talk with their lender? Yes, borrower should communicate with their lender when facing financial hardship. During the counseling process, some lenders will contact the homeowner to verify the information submitted through the housing counselor. Loan modifications, or workout solutions, are completed between the lender and borrower. The housing counselor guides you through the process and assists in making knowledgeable, well-informed decisions to accept, or decline, any lender approved loan modifications. 6. What is a short sale? A short sale is the lender accepting less than the full balance of the mortgage to sell the home. Lenders generally require the home to be on the market for a minimum of 90 days, trying to obtain fair market value, before a short sale offer is accepted. However, some will disclose the minimum acceptable price to accelerate the sale. 7. What is deed-in-lieu of foreclosure? “Deed in lieu of foreclosure” is an agreement by the borrower to return control of the property to the lender . If the lender agrees to forgive the loan, the borrower agrees to give back the deed to the property, and vacate it. 8. What are the fees associated with foreclosure? Once the foreclosure process starts, legal and other fees are typically added to the loan balance. These fees may include court filing fees, process server fees, lawyer fees, auction fees, inspection fees and, if applicable, eviction fees. 9. What is the NC Foreclosure Prevention Fund? The N.C. Foreclosure Prevention Fund™ is a program to assist homeowners adversely effected by job loss to provide funds for mortgage payments, past due amounts, or second mortgages. It is offered by the N.C. Housing Finance Agency, a self-supporting state agency, and funded through the U.S. Department of the Treasury’s Hardest Hit Fund®. Get up to 18 months of your mortgage payments made while you are looking for work or going to school to learn new job skills. Look at our refinance calculators here or here , check our Refinance Mortgage publication, and check our debt counseling offer. A charitable or government agency may be able to provide you with an interest free, deferred loan to catch up your payments, such as the N. C. Foreclosure Prevention Fund. Allows homeowner to remain in their home, gives homeowner up to 2 years to improve their Financial situation, retain majority of their equity.